What is SEM, SEO and Adwords? SEM and SEO have been hot topics among internet marketers for the past decade. Nowadays, many of our clients are curious about how they can use SEM, SEO and associated services (such as Adwords) to grow their business. In case you haven’t started internet marketing and are not familiar with these two easily mistaken terms, here are short explanations for SEM and SEO. SEM is short for Search Engine Marketing which means that you advertise on search engines like Google, Bing and Yahoo by purchasing keywords and bidding for the ads’ display spots. You can see from the picture below that when you search the phrase “sandals for girls”, the top three links on the search page are advertisements from different companies. There are up to eight more text ads on the right hand side of the page as well. The higher the position is, the higher the bid is required. Advertisers can choose to bid for different positions with different budget. SEO is short for Search Engine Optimization which means optimizing your site’s information structure in order to improve your site’s credibility and traffic so that search engines will acknowledge your site with higher rankings for relevant search terms. So when people search such terms, your site will be more likely to show up on a higher spot in the natural search section (which is below the top three paid ads). The higher SEO quality your site has, the higher spot it will get. 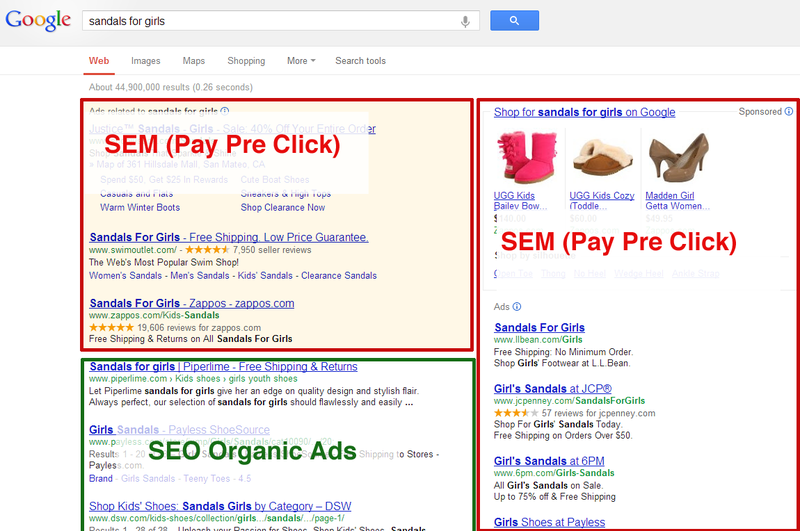 Simply put, with SEM you have to pay search engines while with SEO you don’t. Adwords is Google’s cloud based service that enables businesses to purchase paid Ads. Once you sign into Adwords, you can spend money to advertise your website on Google, Google’s search network and Google’s display network. In order to make Adwords work for you, you need to prepare a list of keywords that are related to your business. For example, our client, DSA, is a manufacturer of light boxes, so its keywords are mostly related to light boxes, such as LED light boxes, slim light boxes and customized light boxes. Then you need to set a bid price for these keywords. But more importantly, you need to know what your goals are with SEM. Do you want customers to just simply view your site, to fill in a survey form or to purchase a product? After clarifying your goal, you need to embed Adwords codes into your goal fulfillment page to enable the conversion tracking. For example, if you want customer to purchase products, you need to embed the codes into the order confirmation page. So when a customer clicks your ad on Google, comes to your site and fulfills a transaction, this transaction will be recorded by Adwords. Hopefully these short descriptions can help you get an initial understanding of SEM, SEO and Adwords. We will be providing more in-depth insights on these topics in the future.